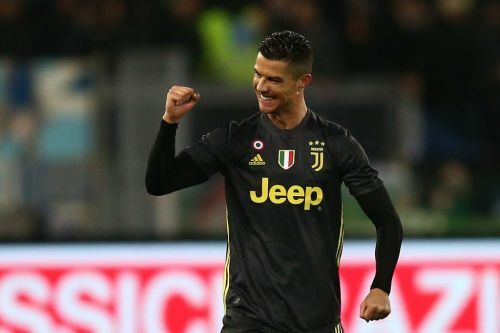 Cristiano Ronaldo was back on the scoresheet after scoring the winner in Juventus’ 2-1 win over Lazio on Sunday. The Portuguese drew a blank in his last game, but made up for it with a last-minute penalty to secure all three points for Max Allegri’s side. The Serie A leaders endured a tough start at Lazio and fell behind early in the second half. A poorly defended corner-kick ricocheted off Emre Can and flew past Szczesny into his own net. In what was an uncharacteristic night for Juve, the Old Lady completed the first half without a single shot on target. However, they managed to overturn things with 15 minutes to go. First, Joao Cancelo drew Juve level with a precise finishing, before Ronaldo wrapped up the winner in the 88th minute. The 33-year-old fired a straight shot, with Lazio goalkeeper Strakosha diving the wrong way. The goal was Ronaldo’s 15th in the Serie A, putting him one shy of Fabio Quagliarella on the top-scorers' chart. The Portuguese appears to have settled in well at Juve and is gradually leading them to the Serie A title. Having joined from Real Madrid last summer, very few people envisaged him taking the Italian topflight by storm. However, Ronaldo has shown that age is just a number and his goals are testament to that. Following his 15th Serie A goal, the world of Twitter has been buzzing with comments. Of course, the debate about who the better player is between Ronaldo and Lionel Messi has also kicked in. With the Barcelona star also scoring over the weekend, it has opened another debate over who the better performer is. However, the dominant tweets are focused on Ronaldo scoring his 15th goal of the season. Football is played for 90 minutes and in the end Cristiano Ronaldo wins. Cristiano Ronaldo had just 1 shot vs. Lazio, which was ultimately the winning goal. Big game? A winner needed?